D-Link, the worldwide leader in innovative networking products, now provides a simple and inexpensive method for businesses seeking to create their own wired or wireless hotspot. The new D-Link Airspot DSA-3100P Ticket Printer is an optional accessory specifically designed for use with the D-Link Airspot DSA-3100 Public/Private Gateway. D-Link, the worldwide leader in innovative networking products, now provides a simple and convenient solution for any business seeking to manage and maximize their hot spot investment. 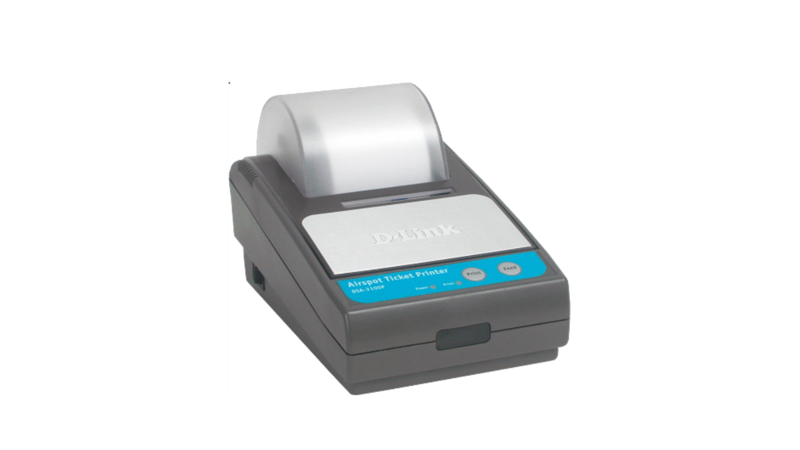 The D-Link Airspot™ DSA-3100P Ticket Printer is a recommended accessory specifically designed for use with the D-Link Airspot DSA-3100 Private/ Public Hot Spot Gateway. Adding a DSA-3100P Ticket Printer to your network setup gives hot spot operators the ability to easily offer, manage, and control user access to their public Internet connection while providing a value-added service for their patrons. Whether your business offers free or fee-based Internet access, your customers will appreciate the benefits of an Airspot-powered hot spot. Take control of your hot spot without alienating your customers with credit card authorizations or wireless Internet Service Provider subscription fees; build better relationships, drive more customer loyalty, and increase profitability. The DSA-3100P Ticket Printer is a hassle-free ticket printer that communicates directly with the D-Link DSA-3100 Private/Public Hot Spot Gateway via RS-232 serial communication to generate and print tickets with login usernames and passwords for hot spot customers. Hot spot operators can use this ticket printer along with the gateway to manage and keep track of up to 2,000 on-demand user accounts in its internal database and support up to 50 active users at any time. Venues offering public Internet access with unsupervised logins risk the possibility of non-patrons accessing the Internet. The DSA-3100P Ticket Printer helps ensure that all users accessing your hot spot are authorized users. Once both the D-Link’s Airspot DSA-3100 Gateway and DSA-3100P Ticket Printer are configured, your business or organization can provide your customers with quick and easy access to your hot spot in just a matter of minutes.